I've never been to Korea. I've rarely even eaten Korean food. 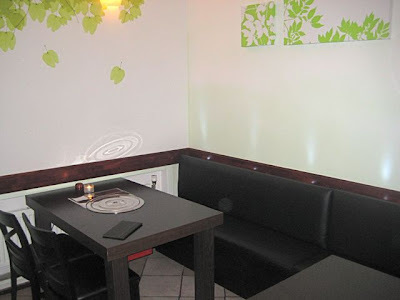 One of the few times was at Hanil in Prague, which we usually go to for sushi. So I barely know kimchi from bibimbap. Still, I was intrigued when I saw that Sami Grill opened up in the Vinohrady space formerly occupied by the Thai restaurant, Tiger Tiger. 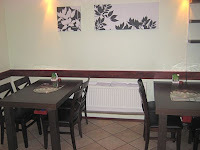 The interior was changed with new lighting and a white and light green color scheme. It was too bright for us. They have special tables with built-in gas grills imported from Korea. There was another unique feature. The tables have buttons you can push to call the waitress. Push it and you hear an electronic "ding-dong" in the other room. 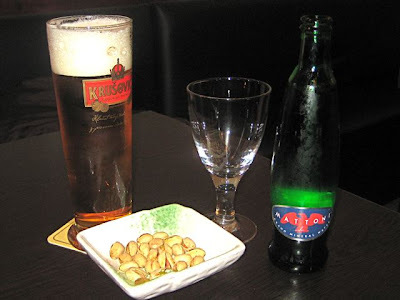 We had two half-liters of Krušovice (40 CZK each) and a .33 liter bottle of Mattoni mineral water (40 CZK). The menu had no real appetizer section to speak of so we went straight to the main event. We really wanted to try out the grill. I took a peek under the protective stainless steel cover. 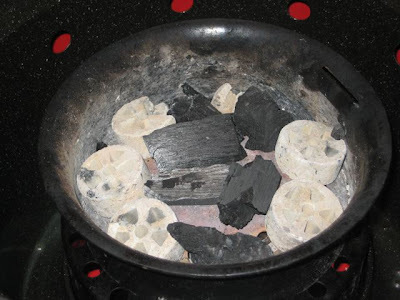 There were a few pieces of charcoal, with flames fueled by a built-in gas can with a control knob. V asked for the duck, but was told it was not available. She didn't want the pork, so she ended up ordering the pricey grilled rib eye (390 CZK). The unmarinated meat was well-marbled. The waitress cooked it on the grill along with mushrooms, onions, and garlic. It was a somewhat awkward procedure. We were given side dishes. There was a dish with bean sprouts, kimchi, another kind of pickled cabbage, and a little seaweed salad. 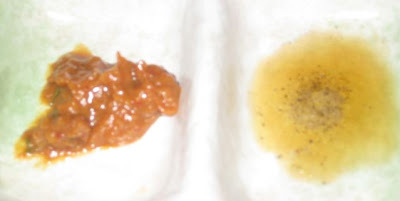 There was another little dish with sesame oil and a very salty soy sauce-flavored paste. 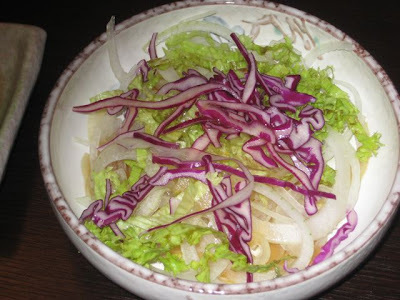 And there was a salad with a lot of onions and what tasted like a rice vinegar dressing. The waitress said there was wasabi in it, but I didn't really taste it. The beef itself? I'd be hard-pressed to identify it as rib eye in a taste test. It wasn't tough, but it wasn't rib eye tender, either. The flavor was pretty unremarkable. Disappointing. I dipped it in the salty soy sauce paste or the sesame oil to keep it interesting. The vegetables were only lightly fried and had nothing special going on. When they said it was grilled over charcoal, I was really looking forward to that smoky taste. It wasn't there. When the food was removed later, I saw that the charcoal under the grill had barely burned at all. The food was mostly cooked by the gas flame and the heated ceramic blocks. I ordered the bulgogi (280 CZK), which a table next to us recommended. I had, in fact, heard of this dish before. I have a friend from L.A. who has spoken of his love for it. It was brought to the table raw. 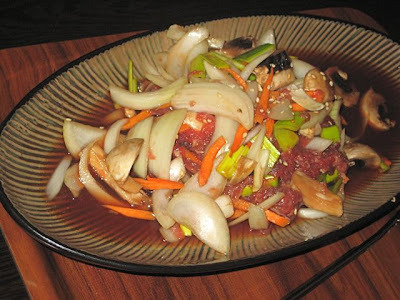 There were onions, carrots, mushrooms, and sesame seeds mixed in with marinated beef. The waitress/chef threw it all into the wok at the table and fried it up. The beef was not the highest quality, but it was pounded hard and shredded to the point that it achieved a certain tenderness. It tasted pretty good, but perhaps it was a little too sweet. As I was eating and thinking this, I realized it would have been much better with rice. It did not come with any, and none was suggested. Halfway through. I ordered a side of rice (35 CZK), and it really helped. However, it brought the price of this course up to 315 CZK, which was really more than I thought it was worth. Whether it was a good iteration of this dish, I don't know. I have nothing to compare it to. Perhaps a Korean foodie can say. It was nice, but didn't excite me enough that I'd dreaming of having it again. The service was friendly, but chaotic. The waitress/chefs were moving in and out of the rooms, alternately stirring the food in a wok, clearing plates from another table, running out, coming back, taking an order, and then stirring some more. The cooking was not getting the attention it deserved. I also had trouble getting clear descriptions of the food from the waitresses. There was also a humorous moment. A couple in the same small room as us didn't like the bright lighting, either. They realized they were sitting next to the dimmer switch and turned it down to a more romantic level. They looked over at us, wondering if it was OK, and we encouraged them to leave it low. We all had a little laugh. A short while later, the waitress came in, took care of some things, and walking by the dimmer on her way out, pushed the lighting all the way back up again. We all had a big laugh. Our final bill was 825 CZK without tip. They bring some complimentary pealed apple slices with it. One could certainly eat more cheaply by avoiding the rib eye (which I would). But it wasn't so cheap for basically two courses, a couple of beers, and a water. 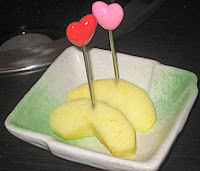 There are several other places that combine Japanese and Korean cuisine. A real Korean food expert will have to tell you how Sami Grill compares. 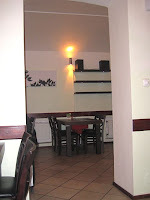 The Prague Post critic brought one for a meal there, and the review had a more positive perspective on the place. We were on our own. I can relate our experience as Korean food novices. Sami Grill wasn't bad, but nothing special for us. I shall probably not make that trip again. Don't know anything about Korean food either, but by your description I get the feeling that Sami Grill tries to work more on the novelty gimmick of having the food grilled right on your table than on the food itself. "Grilling" unmarinated beef of whatever quality right on a gas flave is never going to yield memorable results. I also wonder how trained the waiting staff is. 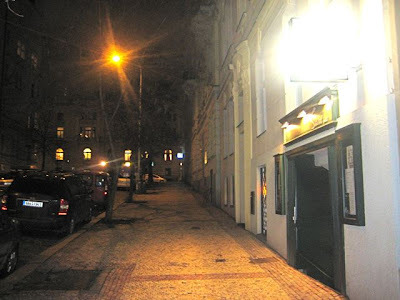 To the poster above (Anonnymous Korean), which Korean (not Japanese) restaurants do you recommend in Prague and why? It was quite interesting to read about Sami Grill which I visited several times. It's understandable that people who expect the real outdoor BBQ in Sami might be disappointed. 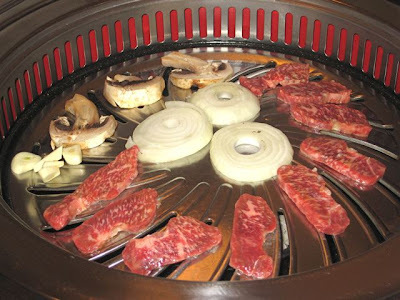 But the grill you can have in Sami is the most typical and popular one in Korea. Even though the price(except the beef,it's even more expensive in Korea) is higher here, I think Sami is the place where people can join the real Korean dishes, not combined with Japaness. 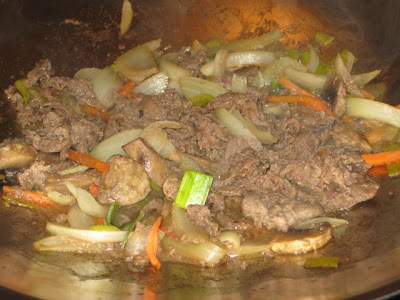 Moreover, they also have pork which is the most popular meat for grill among Koreans and even have different kinds of food apart from grill, which are much cheaper. Let me invite you to the Korean Cuisine Day I organize with Erra Cafe & restaurant. I do it in terms of popularization and promotion of the Korean Cuisine in the CZ as it is almost unknown in the Czech Republic. The concept of my project is based on gastrodiplomacy and focuses on both authentic Korean and especially Korean fusion food appealing to local tastes as an example of how creative initiatives can have a strong impact in promoting Korean cuisine abroad. You can explore Korean food without going too far, as ERRA café & restaurant in association with CHEF’s FRESH regularly hosts the Korean Cuisine Day with a wide selection of traditional korean food. Check out my blog www.chefs-fresh.com/blog to find out more about the next date. Along to the Korean Cuisine Day there is a Korean Cooking Class in association with www.olakala.cz The aim is to spread the knowledge and teach the basic Korean culinary techniques. such a horrible restaurant! they don´t communicate and are not able to answer on e-mails. They don´t do fair play as well. Be carefull about this restaurant!